It is a triple-pronged challenge for respectability, redemption and respite. Manchester United are fighting on three fronts over a pivotal 11 days that will determine if there is any remote chance Louis van Gaal can remain in charge next season. The worst-case scenario is that their rivals provide the Red Devils with three indications of decline. They risk a Europa League exit after their wretched performance against Liverpool and their bitter enemies could strike a knockout blow on Thursday. They must visit the Etihad Stadium, with United, so long the dominant force in England, on course to be Manchester's second side for a third successive season. They may not even be the country's best United. West Ham now look down on them in the league table, and could eliminate them from the FA Cup tomorrow. If that would have once seemed unlikely, it is worth remembering van Gaal's Man United lost a home quarter-final to London opposition, in Arsenal, last season, while West Ham have an outstanding away record on tough trips. They have won at Arsenal, Liverpool, Manchester City and Everton already. They drew 0-0 at Old Trafford in December. Now Man United have gone two games without a goal. As their shot-shy attack faces West Ham's injury-hit defence, something has to give. Winston Reid, outstanding three months ago, is unlikely to figure, leaving manager Slaven Bilic to get creative in recent wins. He outfoxed Tottenham with a 3-4-3 formation. He started with the same shape at Everton last week and ended playing an ultra-aggressive 4-4-2. It poses a dilemma for Van Gaal, who likes to configure his side with the opposition in mind. Second-guessing Bilic is no easy task. 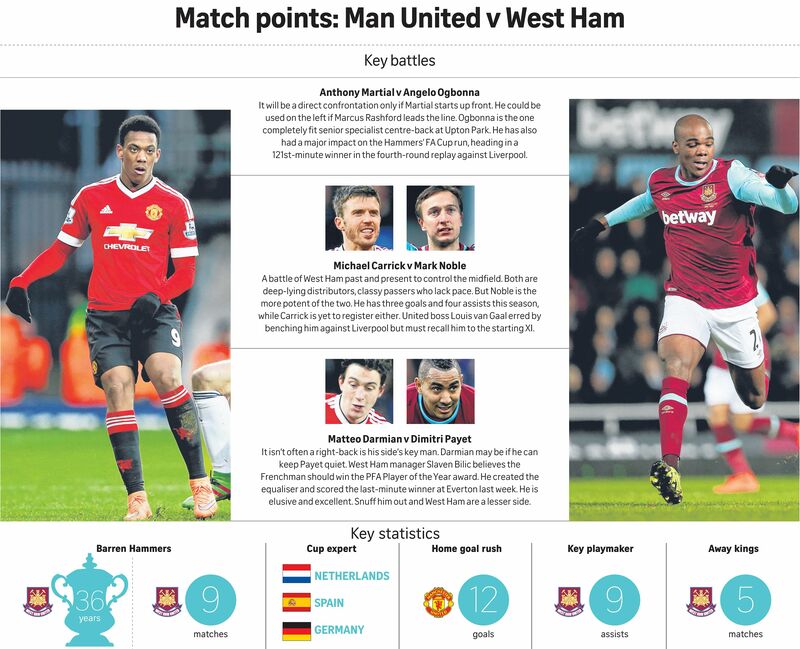 The more famous United concede too many set-piece goals and have to be wary of Dimitri Payet's expert delivery and the height in the Hammers' side. They must mark West Ham's surprise package of the season, the dynamic winger turned wing-back Michail Antonio, who began the campaign at Nottingham Forest and has chipped in with six goals in 15 games. They encounter a side with plenty of pace. Van Gaal's hopes rest with his own speedy duo of Anthony Martial and Marcus Rashford, who are yet to excel together though they are young enough to form a deadly combination for a decade. The emerging attackers are denied a pivotal member of their supply line. Juan Mata is suspended and, with Wayne Rooney injured, the pressure is squarely on van Gaal to find a new No. 10. The chances are that it will be Ander Herrera, while the cautious Dutchman is set to play two holding midfielders. Or he could use Marouane Fellaini as a target man, a tactic that prompted former West Ham manager Sam Allardyce to accuse United of playing long balls last season. It was scarcely in keeping with their traditions. But nor is failing on three fronts and seeing their season end in March.